Included Jump chart to match your dogs' size with the recommended width of the jump. The Broad Jump is a common obstacle in all levels of agility, and obedience. The challenge of this strange looking jump is for your dog to jump over the boards, in between the 4 marker poles,not run on top of it or sideways through the poles. 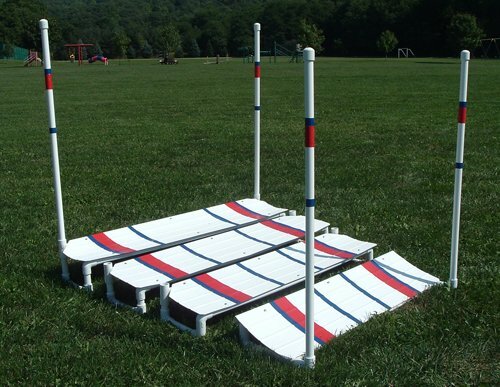 Also called the Long Jump, its challenge is for your dog to jump over the boards, between the marker poles. Our Practice Version of the Broad jump features boards that are weatherproof vinyl & plastic, which are designed to nest inside each other for compact storage and portability. Each set has four boards, how many you use depends on your dogs size. Comes with 4 marker poles that are inserted into sleeves on the boards so you can use this set indoors or out, and when you want to quickly move the set.Colored tape is included to put stripes along the sides and on the poles.